Modular design – pump and cart separate from cylinder and base. Three tonnage capacity options – 55, 100, and 150 tons. Three collapsed height options – 26″, 33″, and 45″. Two standard power options – air (PA55) and electric (PE55). Two control options – remote motor control and remote valve/motor control. Accessory options – 6 5/8″ extension, load-holding rings. Select the collapsed height to fit your most frequent application – add jacking modules to suit your needs. Remote operation for maximum operator safety and control – choose “motor only” or “motor and valve” control in the hand. Easy to maneuver – large tires and small “footprint” make it easy to scoot into the tightest quarters, then locate the exact lifting position. Adjustable, heavy-duty handle – makes this jack easy to move, position under vehicles. Can also be used to transport jack on site with a forklift. Load-holding rings (optional) – provide full rated mechanical load-holding capability. Shielded and sheltered hydraulic lines – for safer, longer, trouble-free service. Cylinder extension (optional) – adds more versatility by extending your jack’s reach. Low-temperature oil (optional) – provides smooth, reliable operation in the coldest climate conditions. Modular design – allows you to change lifting modules to suit your tonnage or height requirements. 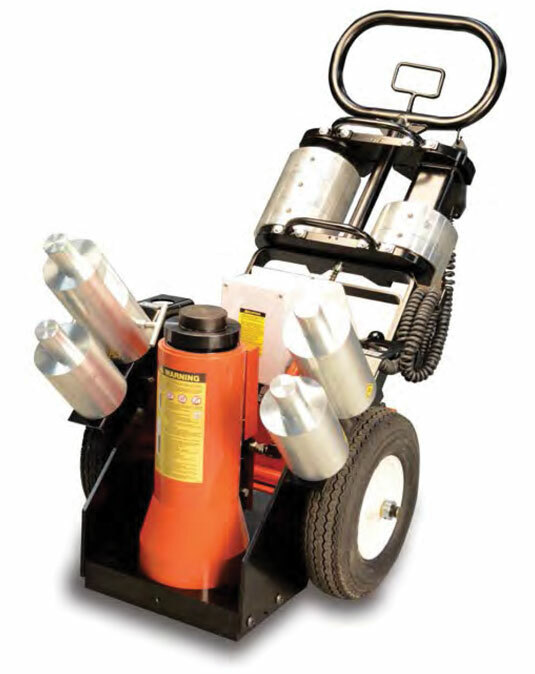 Use the pump module as a portable power station for your other double-acting cylinders (10,000 psi). Exclusive load-control system – provides positive, chatter-free control when lowering the load. Pump and cart modules contain hydraulic pump, cart, remote control and all hoses and fittings required to connect to a jack module. Contact factory on folding handle cart option.